Were you always afraid of touching Linux because you think that the cute Linux penguin logo is too cute and it will going to jump out of the screen and eat your tuna for lunch? You shouldn’t be and with gos, it’s now even easier. 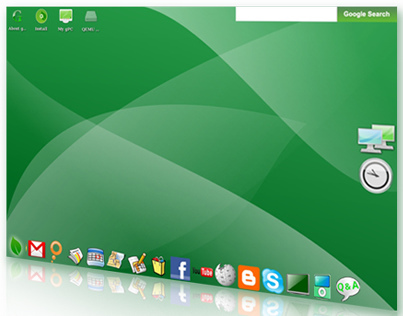 gOs is the new Linux-based platform that builds on top of Ubuntu and comes with built in Google apps like GMail, Google Maps, Google Docs, Youtube, Facebook, Wikipedia, Google Mail, Google Maps, Open Office 2.3, Rhythmbox, Xine player, Gimp, Firefox, Pidgin, Skype etc. The Enlightenment theme and widget like feature on the sidebar make it more user friendly. Just have a look at the screenshot, does it look scary at all? Back in the days when original Ubuntu was just released, you don’t even have a usr interface to tell the LIVECD to install a local copy onto your machine. And now they have a button which will just allow you to do that, how easy that was. I still love the original Ubuntu, it has tons of usable software already in it. I don’t really are about gos, since the original is just as good. But hey, screenshots are always attractive right?! Wow.. Need to view more documentation.